“Rare and refined” is how Nancy Hugo and Jeff Kirwan describe the yellowwood tree (Cladrastis kentukea) in the book “Remarkable Trees of Virginia.” Lovely green foliage; clusters of fragrant white, wisteria-like blooms in May; smooth, beech-like bark; golden yellow fall color; very few pests and diseases — shall I go on? These are among the many wonderful qualities of the yellowwood, one of the trees available through the Arlington Tree Canopy Fund. Often appropriate for small Arlington and Alexandria gardens, the yellowwood is slow-growing and reaches only 40 feet at maturity. It gets its name from the yellow color of its heartwood, an ornamental quality that becomes apparent when a limb has been recently removed. According to Michael Dirr’s Tree and Shrub Finder iphone app, yellowwood is native from North Carolina to Kentucky and Tennessee, but is not commonly found anywhere. Some particularly beautiful examples are found in Arnold Arboretum at Harvard in Boston, Massachusetts. But Arlingtonians don’t need to travel to New England to see one up close. 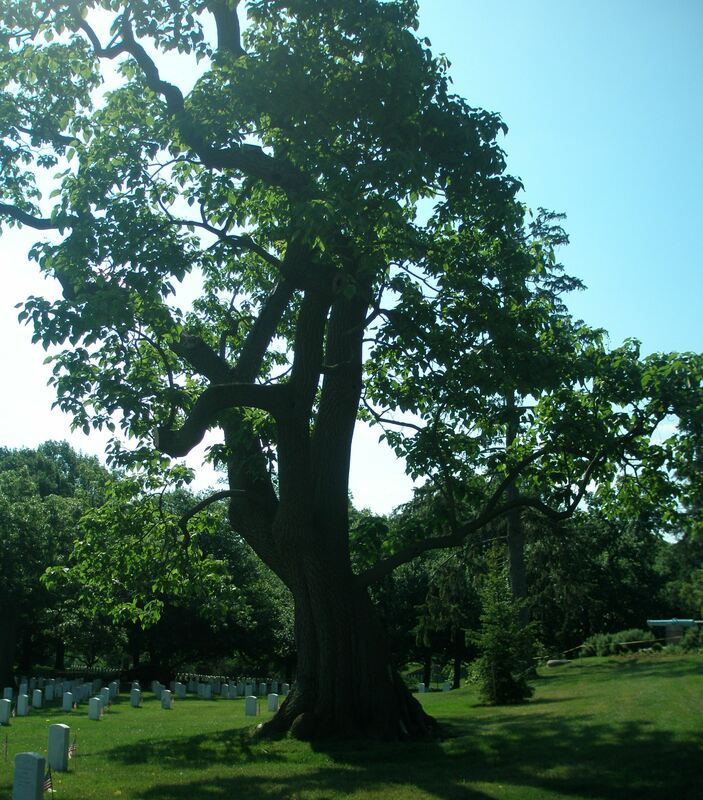 Thought to be the second largest in the state, an excellent specimen stands in Section 23 of Arlington Cemetery just north of the Tomb of the Unknown Soldier, right next to the Spanish American War memorial. On a recent day in May, this yellowwood, believed to have been planted around 1890, was the picture of tranquility — casting a small shadow over the nearby headstones. So, why isn’t this tree grown more often? It is slow to mature and usually doesn’t bloom until it is about 10 years old (or about 15 feet high) — qualities which serve as strikes against its propagation in the nursery trade. It can be an inconsistent bloomer, Dirr reports, but when it does perform, the bees come calling. Many agree that the lovely yellowwood should be planted more — and Arlingtonians have a chance to get their hands on one through the Arlington Tree Canopy Fund. Contact a TreeSteward using the Suggestion Box at the right to learn more about this opportunity. This entry was posted in Education, Tree Care and tagged Tree Canopy Fund, Yellowwood. Bookmark the permalink.